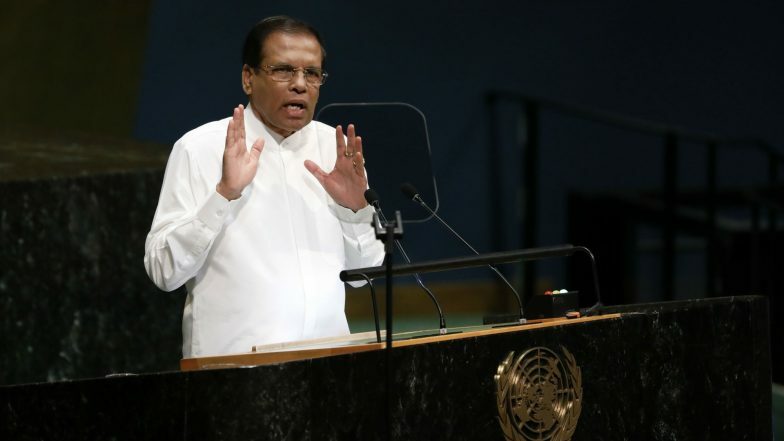 Colombo, April 5: The Sri Lankan government has released about 90 per cent of the military-acquired land belonging to the minority Tamil community held during the brutal civil war with the LTTE, President Maithripala Sirisena said as he seeks re-election. At the end of the military conflict 10 years ago, some 84,675 acres of Tamil civilian land were under the military control and by the end of March 2019, some 71,178 acres of land have been released, Sirisena's office said in a statement on Thursday. Tamil Nadu: Protest Erupt Near Sri Lankan Embassy over 2008 War Crimes. Accordingly, 13,497 acres of land is in the custody of the security forces, of which 11,039 acres of land are state-owned, it said. Another 475 acres of land will be released in the near future, his office said, adding that the de-mining process to clear the land of mines was accelerated after President Sirisena assumed office in January, 2015. The Liberation Tigers of Tamil Eelam (LTTE) had launched a military campaign for a separate Tamil homeland in the northern and eastern provinces of the country for nearly 30 years before its collapse in 2009 after the Sri Lankan Army killed its supreme leader Velupillai Prabhakaran. During the war, the military acquired thousands of acres of land owned by the Tamils near key security establishments coming under increasing threats by the LTTE's suicide squads. For long, the Tamils and rights groups had been demanding the early release of the military-acquired land. Sirisena, who became President in 2015 by defeating former strongman Mahinda Rajapaksa, had promised to achieve national reconciliation with the Tamils who had supported him in the election. A task force was established in August last year by the President to expedite the development of the north and the east that suffered most during the conflict. The UN Human Rights Council last month reminded Sri Lanka to make progress on the 2015 resolution co-sponsored by Colombo. Sirisena, who is seeking re-election, has made his intentions clear to win the Northern and Eastern provinces by the perceived swift action on releasing the land. The elections must be held before early January next year. Sri Lanka Government Boosts Budget Ahead of Elections. The Tamils have expressed concern over the delay in implementing other measures needed for reconciliation. The UN Human Rights Council has called for an international probe into the alleged war crimes during the military conflict with the LTTE. According to the government figures, around 20,000 people are missing due to various conflicts including the 30-year-long separatist war which claimed at least 100,000 lives.